Noida is deemed as an emerging city with well planned commercial hub with lots of options available to set up their commercial office space in Noida. 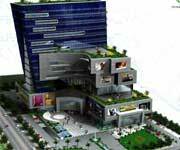 With commercial office spaces the city has laid emphasis on the effective development of commercial sector in Noida. Companies always need a right real estate advisor who can assist them in getting good and better office space in Noida at best price. PropWorld expert can you give you deep knowledge of not only commercial space but each and every part of real estate property that you want to go with. PropWorld Realty will solve and ease all you property related needs in one roof. These are the only few inventories of commercial space in Noida but if you need more inventory option , please contact our Commercial expert. Aminities :Large Modular Showroom, Central Atrium,8 Escalators Parking For 2000 Cars, Access from all 4 sides, 20 mt long Sidewalk, Dedicated Floors For F&B and Leisure. Aminities :An energy efficient facade. Large column free office spaces. Contemporary Architecture. Low maintenance cost. Maximum daylight permeates for bright ambience indoors. Aminities :Creative Arena, Auditorium, Gaming Zone, Service Arena, Comprising of Restaurants, Food Court, Bank, ATM, Housekeeping etc. Aminities :Located at the nodal point of Noida City Center planned by Noida Authority. Great accessibility with roads of 45 and 75 mts on two sides.